Software-as-a-service company Womply recently launched Womply Engage, a cloud-based software platform designed to help small businesses keep track of customers while automatically building engagement. The automated system builds and updates customer profiles to create a customer directory, sending personalized emails to customers without any work required by the business, the company stated. Womply’s new, updated Customer Directory, originally launched in 2017, uses transactional data to create customer profiles, which are then updated with each subsequent customer transaction. Merchants can also manually create or update customer profiles. Merchants can peruse the searchable database to find and filter customer records, create personalized promotions and marketing campaigns, and drive repeat business. Customer Directory will automatically flag the top 100 patrons, establishing hierarchies based on customer average ticket, number of purchases and lifetime value to the business. Email campaigns: Automatically sends timely, targeted emails. These personalized campaigns can welcome new customers, reward loyal customers and win back inactive customers. Merchants can use a dashboard to track campaign performance. Customer loyalty: Builds customer loyalty and encourages repeat business through holiday reminders, birthday greetings and other personalized messages. The platform can also gather feedback, encourage online reviews and help customers make reservations. Customer relationships: Helps small businesses identify their customers by name, see customer lifetime value and purchasing history, and find customer email addresses. The platform will automatically send personalized emails to each customer to drive relationship value. Enhanced reporting: Summarizes marketing campaign performance in weekly or monthly emails. These reports chart campaign results, allowing merchants to see how frequently their business is getting into customers’ radars and the resulting impact on revenue. 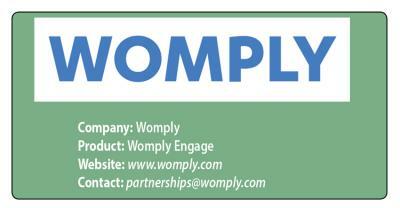 Womply’s extended family of sales channel partners includes credit card processors, acquirers and ISOs. The company commended its partners for consistently improving customer retention rates and net promoter scores, while reducing attrition by an average of 17 percent. Womply’s products and services can help channel partners sell more services, while shifting the focus from saving money to adding value, the company stated.